"Our work is the first to send messages in a secure manner using high-dimensional quantum encryption in realistic city conditions, including turbulence," said research team lead, Ebrahim Karimi, University of Ottawa, Canada. "The secure, free-space communication scheme we demonstrated could potentially link Earth with satellites, securely connect places where it is too expensive to install fiber, or be used for encrypted communication with a moving object, such as an airplane." 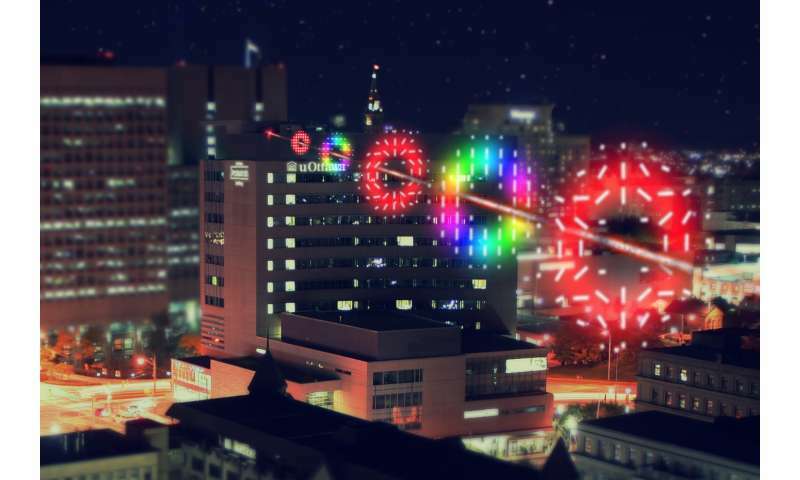 As detailed in Optica, The Optical Society's journal for high impact research, the researchers demonstrated 4D quantum encryption over a free-space optical network spanning two buildings 0.3 kilometers apart at the University of Ottawa. This high-dimensional encryption scheme is referred to as 4D because each photon encodes two bits of information, which provides the four possibilities of 01, 10, 00 or 11. In addition to sending more information per photon, high-dimensional quantum encryption can also tolerate more signal-obscuring noise before the transmission becomes unsecure. Noise can arise from turbulent air, failed electronics, detectors that don't work properly and from attempts to intercept the data. "This higher noise threshold means that when 2D quantum encryption fails, you can try to implement 4D because it, in principle, is more secure and more noise resistant," said Karimi. Although wired and free-space quantum encryption has been deployed on some small, local networks, implementing it globally will require sending encrypted messages between ground-based stations and the satellite-based quantum communication networks that would link cities and countries. Horizontal tests through the air can be used to simulate sending signals to satellites, with about three horizontal kilometers being roughly equal to sending the signal through the Earth's atmosphere to a satellite. "After bringing equipment that would normally be used in a clean, isolated lab environment to a rooftop that is exposed to the elements and has no vibration isolation, it was very rewarding to see results showing that we could transmit secure data," said Alicia Sit, an undergraduate student in Karimi's lab. As a next step, the researchers are planning to implement their scheme into a network that includes three links that are about 5.6 kilometers apart and that uses a technology known as adaptive optics to compensate for the turbulence. Eventually, they want to link this network to one that exists now in the city. "Our long-term goal is to implement a quantum communication network with multiple links but using more than four dimensions while trying to get around the turbulence," said Sit.